Photograph of the Turkish Sultana's House, Fatehpur Sikri, from the Archaeological Survey of India Collections, taken by Edmund William Smith in 1893. Fatehpur Sikri was built by the Mughal Emperor Akbar (r.1556-1605) between 1571 and 1585. The Turkish Sultana's House is situated beside the Anup Talao, a tank on the north-east of the Diwan-i-Khas, or Hall of Private Audiences. It is a small one-roomed building with a large sloping roof, surrounded by a verandah which was once separated into extra rooms by screens which have since been removed. The entire building is covered in intricate stone carvings of geometric patterns, trees, birds and animals. 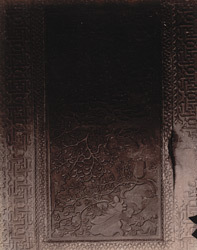 A carved dado comprises eight carved panels. The panel in this view depicts a forest scene with monkeys and birds scampering among the branches of a banyan tree. A group of horses stand below the tree, one of which is drinking water from a pool covered with lotus flowers.